Just in from Jeannette MacDougall, our resident director at the VCCA's studio center in France, news and photos from the season's first workshop, "En Plein Air: Writing and Painting in South West France," led by VCCA Fellows Buffy Morgan and Mary Page Evans. Eleven people registered, including VCCA poet Laura-Gray Street, traveling to the village of Auvillar from Maryland, Virginia, California, New York, New Hampshire and Paris. It was "incroyable" says Jeannette. Participants borrowed inspiration from the region's breathtaking landscape and the village's spirit of hospitality. Be sure to check out this fall's painting and writing workshops led by Fellows Danny Hauben and Bruce Bauman. The workshops in Auvillar are open to individuals working at all levels in their genre. The VCCA has partnered with the Virginia Commission for the Arts to offer a one-day career-building workshop for visual artists living in Virginia. The workshop is designed and led by Creative Capital, a national nonprofit organization that supports artists through grants and professional training. The only cost is a $40 registration fee. Space is limited, so sign up now. Call 434-946-7236 for more information. Poets in residence Marilyn Kallet and Jane Satterfield will read after dinner Thursday, at 7:30 p.m. in the Residence living room. Marilyn's latest book is Circe, After Hours, from BkMk Press. She is the author of 14 books, and is the Lindsay Young Professor at the University of Tennessee. Jane's latest prize-winning book is Assignation at Vanishing Point. She is a professor at Loyola University. While at the VCCA, Marilyn is blogging about her residency for "The Red Room," self-described as "the online home of many of the world's greatest writers. . .a place for the literary community to promote their work, express themselves, and connect with their favorite authors." Aloha! The Fellows' dinner last night was served pool-side, luau style, complete with a "Monki Bar," (so spelled in honor of Executive Director Suny Monk), leis, orchids, coconut monkeys, and a polynesian spread. Fellows and staff ate at dusk, the bamboo tiki torches ablaze, much sated and contented after a day of hard work. Thank you Chef Rhonda, Bruce, Cora, David, Mary, Mike, Sheldon and Zane for a delightful evening. Fellow Presents "An Inconvenient Truth"
VCCA Fellow and composer Nathan Currier will appear at Riverviews Artspace in Lynchburg, Friday, July 18, at 6 p.m. to speak on the topic of global warming. Nathan is one of a select number of volunteers personally trained by former Vice President Al Gore to present a version of the slideshow featured in the Academy Award-winning film An Inconvenient Truth as part of Gore's Climate Project. Winner of the Academy Award, for lifetime achievement, from the American Academy of Arts & Letters, as well as a winner of the Rome Prize for composition, Nathan has frequently been honored for his many compositions, which have been widely performed in the United States and abroad. 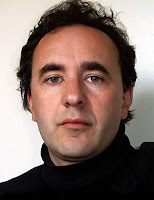 He is currently a visiting faculty member at the University of Virginia in Charlottesville, Virginia. Tune In: VCCA Fellow Appears on "Jeopardy"
VCCA composer Randall Eng made his game show debut Monday, July 14th, appearing as a contestant on "Jeopardy." Apparently round one went very well as he appears again tonight, Tuesday, July 15th. Click here to check your local listings. When he's not appearing on games shows, Randall's work straddles the worlds of opera, music-theatre, and jazz. He and his wife Katie Baldwin-Eng (also a VCCA Fellow) and daughter Olive live in NYC. Right: Randall and "Jeopardy" host Alex Trebek. A five-year retrospective exhibition featuring the work of VCCA Fellows who have been in residence at Moulin à Nef was recently on display at our studio center in France. The exhibition includes the work of 34 Fellows and included drawings, poetry, photography, paintings, film, fiction, essays and CD images of work, events, Auvillar, and participants. In addition, almost 40 people attended the community dinner held on June 15 in the Moulin à Nef's spacious ceramics studio. Some were friends we've known since our first visit five years ago. Some had never been to Moulin à Nef. Several joined as members of VCCA France (Please ask us how you can join for $25!) To a person, they delighted in seeing the work of VCCA Fellows again and sharing stories of your visits. They were especially touched by our Fellows' written remembrances of their village, which appeared alongside work in the exhibition. 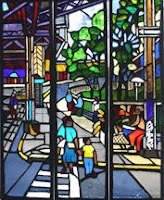 Danny Hauben's work of faceted glass panels depicting Bronx street scenes at the Freeman Street 2 & 5 elevated train station in the Bronx has been selected as one of the exemplary works of public art in 2007 at the Americans for the Arts Public Art Network. The selection was announced at the PAN conference last month. The work was commissioned by New York City's Metropolitan Transit Authority's (MTA) ARTS FOR TRANSIT program. Since 2001, Americans for the Arts Public Art Network's Year in Review has annually recognized 40 exemplary works of public art. An acclaimed plein air painter and longtime VCCA Fellow, Danny will lead a painting workshop this September at the VCCA's French outpost, the Moulin à Nef studio center, in the village Auvillar. The workshop is being offered in partnership with the Beverley Street Studio School. The work of VCCA Fellows Ed Epping, Shirley Nisbet and Ryan Russell will be exhibited at Riverviews Artspace in downtown Lynchburg beginning July 4 in The Vanishing Landscape exhibit. Each artist’s work is a reflection of their view of the environment that surrounds them and each has an intimate connection to the land as they are constantly viewing it and trying to understand its changing aesthetics. They use landscape painting to comment, to varying degrees, on environmental degradation and global warming they see around them.